The classic Madballs are being remade by Mondo as highly detailed vinyl toys. These new versions are now called MONDOBALLS. They'll be available for preorder on www.mondotees.com in early February. I'm really into the gross out era lately, so if the price point is manageable I will be all over these. They are also planning to expand to licensed characters in the near future. One of the influential designers of that time and original designer of Madballs, James Groman is still going strong. You can follow his work on instagram. Click the image to listen to all their shows online! I am a late adopter when it comes to podcasts. I know they've been a thing for about 10 years now, but I have only had a smartphone for about the last 4 years and didn't warm up to really consuming media that way until recently. One day I downloaded a Pod Catcher for my Android and instantly started searching for toy podcasts. Surprisingly there aren't as many as I thought there were (at least through Stitcher). Talking Toys with Taylor and Jeff instantly stood out from what was available. The basic format of the show is that they pick a classic toy line from the past and talk about it for an hour or so. They break each show up into sections and cover different aspects. There is an overview of what was available in the line, some insight into how they function and were made, their top 5 favorites and so on. They are up to 43 regular episodes, with a bunch of standalone episodes on individual Star Wars figures and Masters of the Universe figures. The rapport between the two is fun and casual. That really makes it stand out from other podcasts I have listened to. It's a real easy listen, a nice balance between professional and natural. This show is highly recommended to anyone that has an interest in the history of toys. I know it has broadened my horizons. Continuing with the Christmas present theme, Tara gave me a full case of blind box Adventure Time mini figures that she got at Toy Art Gallery's closeout sale. It was more fun than I expected to open up so many little boxes. It was like getting 18 little presents all in a row. After the dust settled I ended up getting everyone I wanted except Magic Man. The 80's goodness coming out of NECA is starting to take over my shelves. I'm going to have to cycle things out from time to time because I can't bear to have them hidden away in the pantry for too long. Last night I re-did the shelf with Alien and Predator stuff. It will pop a bit more when I get the eggs and repair my Bishop and City Hunter Predator. I can't wait for the Kenner inspired Alien stuff to come out. There is bound to be some reveals at ToyFair next month. This article gives a great overview of what it takes to bring a toy line to life. It focuses on the development of the various types of figures in the current Force Awakens line. I appreciate the thought and care put into these products. While I am normally very critical about reverting to a simpler articulation scheme, in this case is seems to make some sense. The inclusion of the extra armor pieces and buildable turret guns really sparks the imagination into places beyond just what happens in the movie. The 5 POA figures are also that much more palatable because there are other options for collectors in their "Black Series" both in the 6" scale and the 3 3/4". Thanks to www.battlegrip.com for pointing out this article. Mondo is really killing it with their new collectibles. Up next is a 1/6th scale baby Hellboy from the moment when Rasputin pulled him into the world. Summoned to Earth on December 23rd, 1944, the half-demon child known as Anung Un Rama was intended change the tide of WWII in Germany’s favor. Instead he was discovered by US soldiers, given the name Hellboy, and would go on to fight the forces of evil as an adult. Working closely with creator Mike Mignola to design the definitive baby Hellboy, we’re thrilled to release a figure featuring 6 points of articulation (neck, tail, shoulders, right elbow, and right wrist), and the cutest lil face Hell ever spawned. 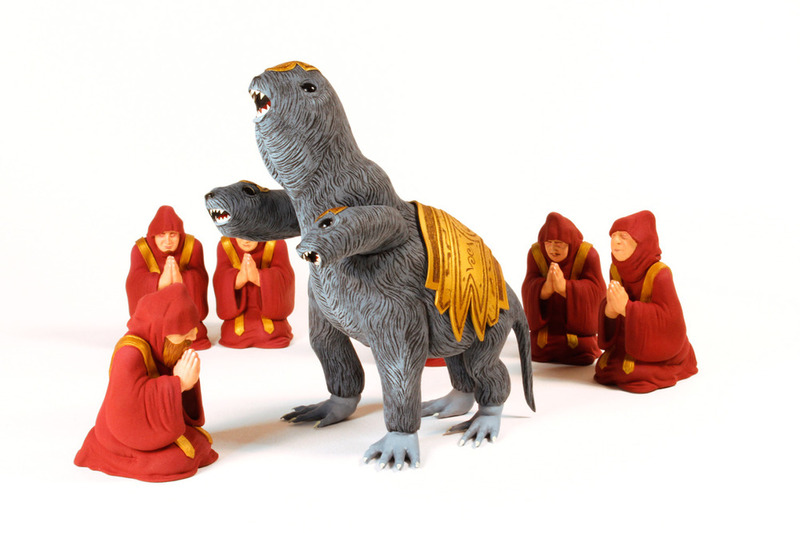 In addition to the regular version, we’re releasing an exclusive version – available exclusively on Mondo site – with the removable Crown of the Apocalypse. The exclusive version will be available for 72-hours only (until Thursday, Dec. 17th at 12PM central). Now’s your chance to hold this little bundle of demonic joy in your own hands! I'm not a 1/6th collector, but I can appreciate a good figure when I see one. I hope this is just the first of many Hellboy figures they make. I'm really happy with my Mezco figures, but it's been a while since there has been good comic based Hellboy figures on the market, it's time for more. BIG TRUBBLE and ANSER have collaborated to bring together “Painted Face”, a three dimensional version of the well known Toronto street art icon. LAIRD, BIG TRUBBLE’s head toy artist, has created individually tinted casts of the face that ANSER has then painted with original line work. No two are the same, mimicking the fact that the iconic face is never drawn the same way twice. Each piece is 6”, cast in resin and is stackable. The new release will debut at ANSER’s “Crowded Kingdom” at #Hashtag Gallery, 801 Dundas St. W. Toronto, February 27th 7:00 – 11:30. 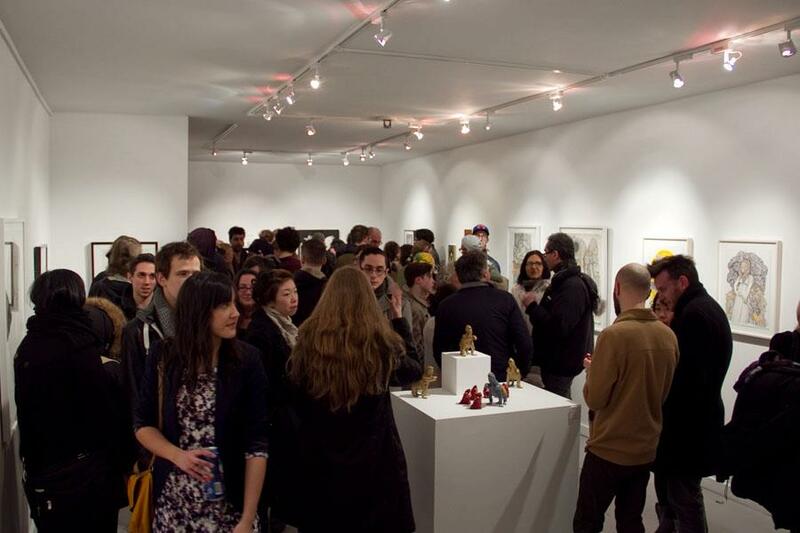 The show runs until March 9th. Laird Henderson of Big Trubble Toys created this incredibly awesome figure called the Ghost Pig. Once a pig and then a juicy ham, he’s a porcine phantom rising from between the salty, smoky slices of someone’s dinner toward another plane of existence or perhaps to haunt your pantry. Beautifully sculpted and then cast in resin, standing 7” tall, and hand-painted with cel-vinyl, the Ghost Pig is being released in a limited edition of 30 pieces and is currently available for purchase here or at the Magic Ponystudio, gallery, and shop in Toronto, Canada. We can’t help but think that, should he decide to linger on Earth, the Ghost Pig would be great friends with our beloved Slicey the Pig. How could those two not have great adventures together? Thanks for the post! So many notes! I am sure he would find a kindred spirit in Slicey the Pig. I know $200 seems like a chunk, and it is, but they are quite a bit of work to make. To take the edge off I include the cost of shipping to anywhere in the world. $200 CDN too, so it’s a bit less for you Americans! If you’re in the Chicago area this piece (along with some others) will be featured in Rotofugi’s “Northern Lights” on Saturday July 6th. 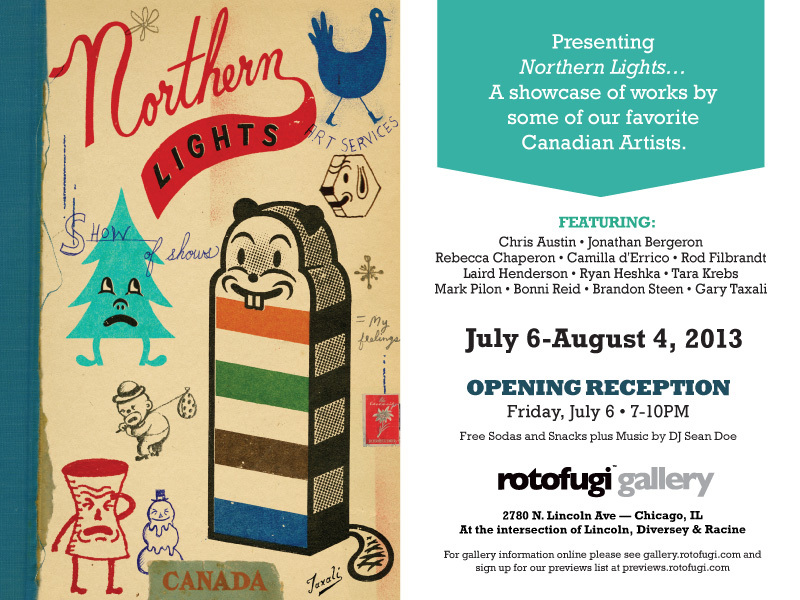 Big Trubble art toys will be featured in Rotofugi’s next group show entitled “Northern Lights”. The show features several other Canadian Artists as well. Rotofugi is one of the most respected toy shops and galleries in the world, so I am very happy to be a part of it. I will be bringing along Leader, Ghost Pig and God: Incognito. Drop by if you happen to be in Chicago! I am proud to be a part of this amazing show at Magic Pony on Friday the 15th. If you’re in the Toronto area be sure to check it out. It opens at 7pm on March 15th and runs until April 14th. 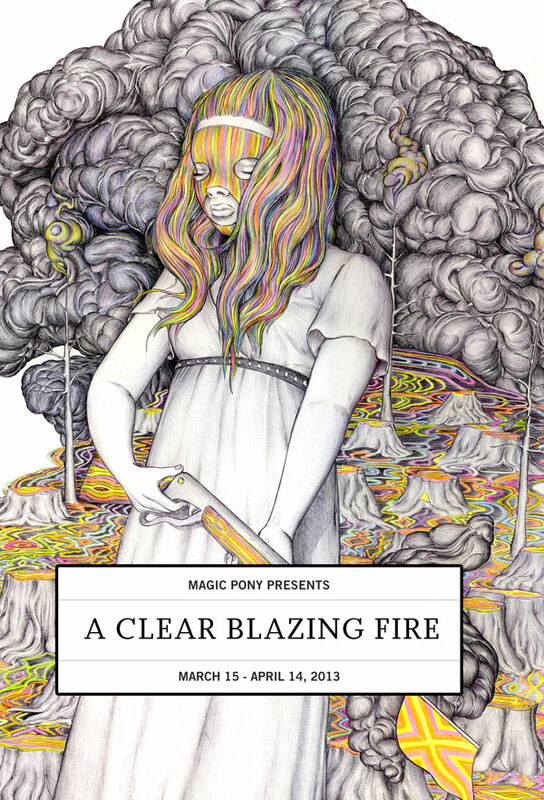 Magic Pony is pleased to present ‘A Clear Blazing Fire‘, the gallery’s first exhibition of 2013. Featuring work by Alexandra Mackenzie, Howie Tsui, Jamiyla Lowe, Laird Henderson, Nathan Jurevicius, Patrick Kyle and Theo Gallaro. Here’s a peak at the new display case I debuted at the Walnut Studios open house a couple weeks ago. Twas was a grand ol’ time! I’ve been toiling away on a new collaboration with artist James Olley. The figure is based on his painting “The Phone Call”. I sculpted, molded and casted, while James worked his magic with the paint. The dripping technique he uses makes each one an original. I went to New York City a few days before NYCC and was able to go to some of the designer toy shops. One of which was My Plastic Heart. For such a tiny little place it sure does make quite an impression on the toy scene. I happened upon Doktor A setting up his show “Postcard from New Yorkshire”. I came back a few days later for the opening and was very impressed. The pieces are a combination of customs and originals with found objects. They all fit seamlessly into his Mechtorians world. 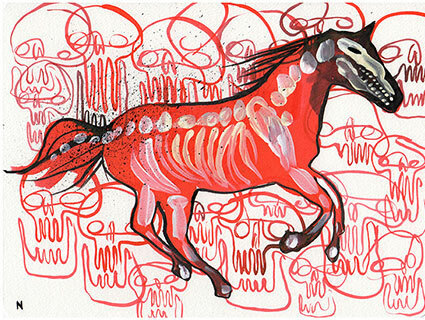 You can see the pieces up close on the MPH website and his own blog.